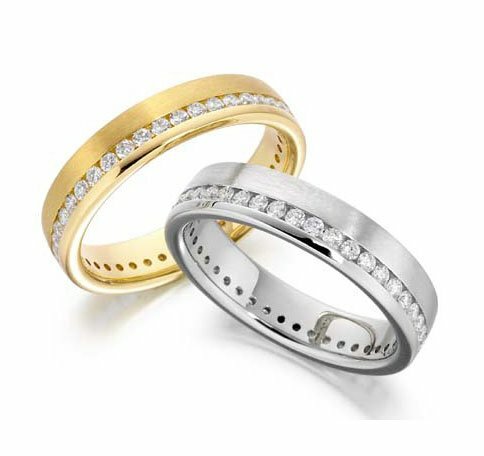 Traditionally an eternity ring is a row of diamonds encircling a ring to symbolise an eternity of love. Nowadays there are many variations of this design, with different styles of setting, different shapes of stone or multiple rows. Coloured stones work just as well, either on their own, or combined with diamonds. A popular alternative is a half eternity (theoretically just as long). In this ring the stones only go on the front of the ring. There are several advantages with this design; it is easier to change the size as the back of the ring is plain, there is less chance of breakage if a delicate stone is used and fewer stones make it less expensive. We stock a range of these rings or our workshop can create one to compliment an existing ring.